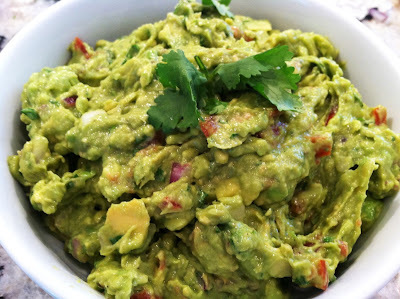 Guacamole is one of my favorite appetizers. It's fresh and simple to make. The only tricky part about making guacamole is guessing when the avocados are the perfect amount of ripeness and ready to use. I use Hass avocados and they will turn black from green when they are ripe and if you push in with your finger it will leave a slight indent. When the stars align, you are ready to go. I get rave reviews with this recipe. Slice the avocados in half and remove the pits. Scoop out the avocados into a large bowl. Add all other ingredients and use a fork to mash everything together to your liking, some like it chunky (that's me!) and some like it smooth. Add more salt, lime or hot sauce to taste. Tip: If you keep a couple of the pits in the guacamole, they help preserve the beautiful green color longer. Serve with chips and enjoy!